Are you looking for an all-inclusive hotel? We’ll tell you why it’s the best choice! They allow us to stick to our budget, as they already include the biggest costs, especially food and drink. The other additional expenses tend to be small extras, such as trips, but these won’t go beyond the amount you had in mind. These hotels are ideal for enjoying a family holiday, resting and relaxing, as you don’t have to worry about looking for restaurants that suit all tastes. All-inclusive hotels have a little bit of everything, from cocktails to kids’ menus, so everyone will be happy. You’re not restricted to opening hours, as there are always restaurants and bars available during most of the day (and night). They also tend to include organised leisure activities for all ages: water sports, tennis or padel matches, clubs and discos for kids and adults, musical performances, etc. So, you’ll never get bored. It’s easy to find offers and discounts, so you can bag a family holiday at a very competitive price. At Hotels VIVA, we want to offer you the best experience and adapt to your needs. We know that all-inclusive can mean freedom and a sense of calm for adults and great fun for the kids. VIVA Sunrise. Located in the incredible Puerto de Alcudia, this is a family Aparthotel, but at the same time, it specialises in sporting holidays with incredible equipment for cyclists. 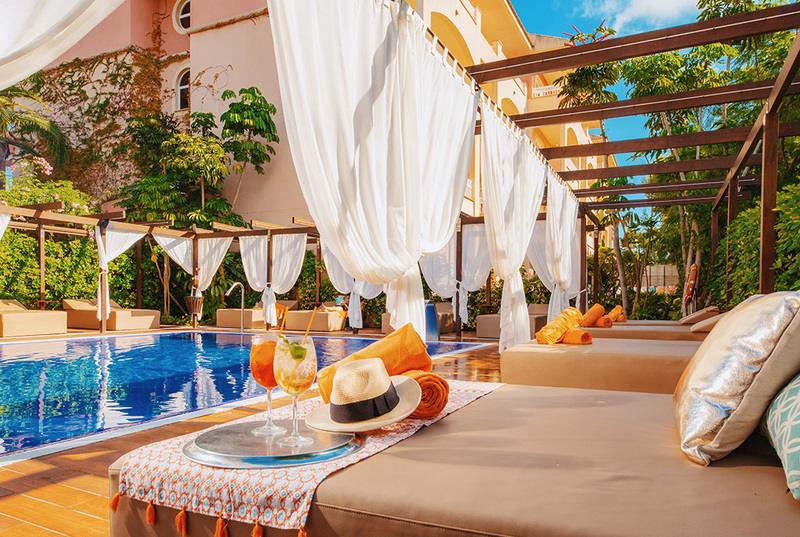 We’ve got the best leisure offering and a quality all-inclusive option. Sit back and relax or enjoy your favourite sport while your kids have endless fun. How does that sound? VIVA Eden Lago. A magnificent all-inclusive where you can enjoy a top-quality buffet and many more services. The rooms are comfortable, elegant and modern – perfect for a good night’s sleep. It’s located in Alcudia – the best of Mallorca. VIVA Cala Mesquida Resort & Spa. A Resort located in the dreamy surroundings of Cala Mesquida, with a gourmet option – Elite All-Inclusive, for lovers of exquisite food. As many as 7 restaurants to choose from, all of which guarantee variety and top of the range dishes. It’s one of our most versatile hotels, as you can relax, take part in family activities and enjoy sports. VIVA Blue & Spa. An Apartahotel that’s perfect for families and at the same time, ideal for enjoying a variety of sports, as it has top quality facilities, especially chosen for lovers of sport. It’s also located just a few metres from the S’Albufera Natural Park, which has been recognised as National Interest by UNESCO. Choosing an all-inclusive hotel in Mallorca could be the best choice, especially if you’re travelling as a family. You don’t need to worry, as you control your budget and at Hotels VIVA, we guarantee quality, comfort and exclusivity. And, if that wasn’t enough, if you stay at Hotel VIVA Blue & Spa or at VIVA Sunrise and choose all-inclusive or elite all-inclusive, we’ll give you a fantastic bus tour around the stunning surroundings of gorgeous Alcudia. What are you waiting for? Come and enjoy the VIVA spirit!